We wanted to know more about celebrity teen chef, Haile Thomas, the inspiration for My Social Canvas’ Feed Your Beauty campaign, which benefits healthy cooking classes for adolescent girls in underserved communities. She told MSC about her favorite foods, healthy eating choices, and passion for feeding her inner and outer beauty. What inspired you to get involved with health and how did it become your passion? When my father was diagnosed with Type 2 Diabetes I realized that our family had to do something about this serious condition, so I took my passion for cooking and learned how to make our families’ favorite dishes healthier. My family and I made these favorites with healthy twists, and became educated about the risks associated with eating a diet heavy with processed foods, and also about the importance of physical activity through documentaries and books. After we were able to reverse my dad’s diabetes, I knew that I wanted to share my story and inspire my peers and their families to make healthy lifestyle choices as well. When were you first interested in healthy eating? After my father’s diagnosis, I was inspired to learn more about Type 2 Diabetes in particular. It’s something that runs in our family, and also affects kids, and I found out that food plays a huge role in the condition. I began to analyze our eating habits, and I quickly learned that we weren’t eating enough nutritious foods on a daily basis. I got in the kitchen with my family and started to experiment with different healthy ingredients, and I learned that vegetables are delicious and fun to make. This eventually led our family to embrace a vegan way of eating, and it’s been a lot of fun getting creative with nutritious whole plant-based foods. It really was life changing in many ways. If you could pick one food to eat for the rest of your life, what would it be and why? I’m a very adventurous eater, so I don’t think I would be too happy about eating one thing for the rest of my life, but I do have a food that I absolutely love to eat and cook with on a regular basis! I love mushrooms, they’re so versatile and you can flavor them any way. They are fantastic in curried stews, in burgers, and even occasionally fried for a crispy treat. Also, there are many varieties, so it’s basically impossible to get bored with them. My latest favorite is King Oyster Mushrooms, I can make them taste like scallops with a little seaweed seasoning, and that’s fantastic because seafood used to be a big favorite for me! What does My Social Canvas mean to you? To me, My Social Canvas represents a platform for girls to spread awareness about the things that they care about, with the hope to inspire others to be fearless in advocating what they believe in, while creating the life of their dreams. I feel very lucky to be associated with a company that is so dedicated and invested in my success and growth as a girl with a mission who is working toward my dreams. 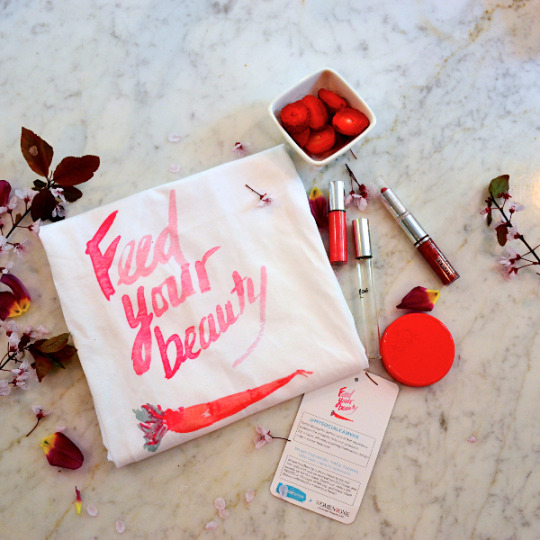 What do you hope other women and girls will feel while they are wearing your “Feed Your Beauty” shirt? I want it to be a reminder that the things that we feed our bodies are the building blocks to inner and outer beauty. I also want women and girls to feel empowered to make healthy choices and to also know that when they feed their beauty, they feed their self-confidence and they feed their self-esteem. This all has a positive effect on how inspired and motivated they are to pursue the happy healthy life they are meant to live. What final message do you want all girls and women to walk away with? I want all girls and women to know that when they feed their beauty, the best version of them will shine through! You can follow Haile on Instagram at @haileteenvegan, Twitter @chefhaile, and visit her website hailevthomas.com. First Lady Michelle Obama welcomes junior chefs and their parents to the 2013 Kids' State Dinner at the White House. July 9, 2013.